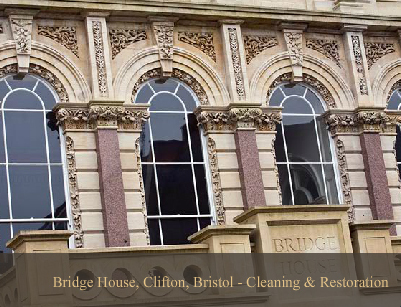 Our widely experienced staff will advise on the most suitable cleaning method for your building. With cost effectiveness in mind and taking into consideration the nature of the material, its general condition and structural integrity. We also take into account the condition of the mortar pointing, condition of the windows and other places where water ingress could occur. Windows are carefully protected to help prevent any water ingress using clean polythene sheeting and waterproof tape. The subsequent removal of this tape can remove unsound paint films; therefore consideration should be given to this before any cleaning work is undertaken. Our estimator can advise you on this at quotation stage. We use modern methods of cleaning which include the ‘JOS’ vortex system and ‘DOFF’ high temperature steam system including the traditional Nebulous spray process. Chemical cleaning methods are used only where absolutely necessary and only then with due consideration for the environment. The removal of paint from stonework can be achieved by the traditional method of mason dressing, applying a poultice or by using the modern method of the DOFF steam cleaning system. You will be informed and given full details of our proposed cleaning system to be used at quotation stage.